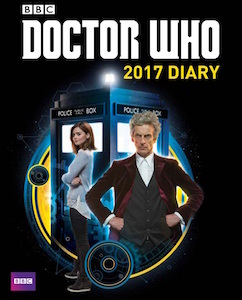 Your live will be all organized thanks to this Doctor Who 2018 diary. The Doctor Who planner is 7 x 9 inches and has a handy spiral binding and it is covered of course with many details from the adventures of Doctor Who. 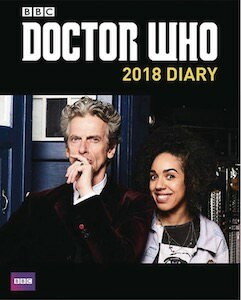 The 2018 planner is based on the 10 series of Doctor Who that was the final series of the 12th Doctor and the season when Bill Potts became the Doctor’s companion. A Doctor Who diary is just perfect for your work and school and you can use it to organize you home life too because thanks to this paper planner you never have to forget any appointments again. 2018 can’t start soon enough because this is the 2018 Doctor Who wall calendar and I know that there is a nice spot for that in your home or office. The Doctor Who calendar will bring you a different Doctor every month and besides that Doctor, it also shows two other images that are from his time. The wall calendar also has an amazing calendar grid that already has all the major holidays filled out and still keeps plenty of rooms for other info like your birthday. Now every month will be special as you just have to turn the calendar and see what Doctor you will see the rest of the month. 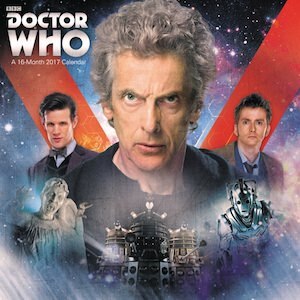 If you are a Doctor Who fan in need of a calendar then you have to take a look at this 2017 Doctor Who wall calendar. 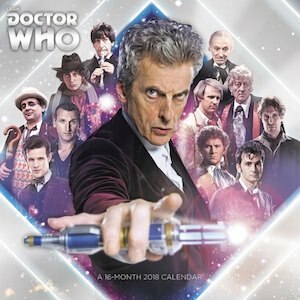 The calendar will bring you many of the Doctors and their villains so that you each month will be reminded about one of the famous Doctor’s and his adventures. Besides the Doctor and the enemies, you will find a nice calendar too so that you can keep track of those important dates and don’t worry major holidays are already filled out for you so you will know when mom and dad need a present. Now you can plan your life with this Doctor Who planner for 2017. The Doctor Who diary is based on series 8 and that means that it does include images from that Doctor Who season and that means that you will find the 12th Doctor, Clara Oswald and even Missy. The week planner is great for school, work and at home and it has plenty of writing space and an holiday calendar so that you know when your next day off is. 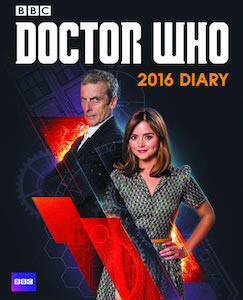 Sure many people now use their phones to plan their appointments, homework and other events but if you like paper then this Doctor Who diary for 2016 could be perfect for you. The 2016 day planner is all about season 8 of Doctor Who with many photo’s of the 12th Doctor, Clara Oswald and of course Missy to. There is a nice weekly spread in this diary and photo’s are everywhere. And don’t worry all the holidays are already filled out for you so that you know when you don’t need to use the planner as you have time to relax and watch Doctor Who reruns. What does a wall in a Whovian’s home need? A Doctor Who calendar of course and this is the 2016 wall calendar that will bring you a new picture of a Doctor Who related photo every month. 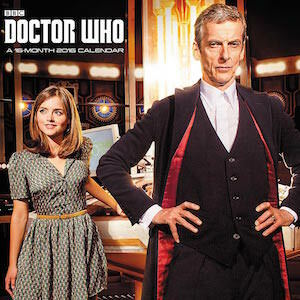 This 2016 calendar is based around Clara and the 12th Doctor but you will also see some other characters they ran into. And you can get this wall calendar right now as it offers 16 months of fun. Even the calendar grid is fun as it does not offer the standard squares but a more fun shape that still offers enough room for important things you want to write. Come get your 2016 Doctor Who Wall Calendar. Wall calendars are great even the Doctor Who one but a poster calendar is better. And this is a special edition 2015 poster calendar from Doctor Who. You will have a new doctor every month of the year and that means you get all the Doctors and yes even the War Doctor is there one month that he shares. Besides amazing poster of the Doctor’s you will find enemies, companions and even the Tardis. 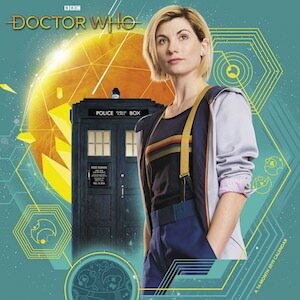 Each month will be amazing as there will be a new 13.5 x 15.5 inch poster of the next Doctor Who and yes the is a calendar so on the poster you will see the calendar of that month but there is no room for writing just for keeping track of the day. This Doctor Who calendar deserves a special spot on the wall. So clear up some space and order your copy of the Doctor Who Special Edition 2015 Poster Calendar. We all like to write things down even though we go more digital every day. But if you are a Doctor Who fan then you are gone love this 2015 diary. Plan you weeks in the grid and read up on info about the Doctor and yes there are great Doctor Who photo’s in here to because otherwise it would be just like any other day planner. 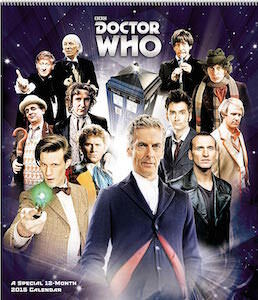 As you can see on the cover Doctor’s 11 and 12 will be there and so will Clara but I promise you all the Doctors will be there even the War Doctor. 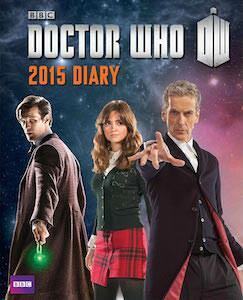 If you want to see and read mores about it then come see this Doctor Who 2015 Day Planner. 2015 will be the year of the 12th Doctor and of course that does not mean that we have to forget all about the past. And to make it easier to remember there now is the 2015 wall calendar that also offers and overview calendar for September – December 2014. Of course this Doctor Who wall calendar has amazing pictures and some of them have Doctors on them like the 12th, 11th and 10th but there are also enemies like the Dalek and there is even a companion to be found. 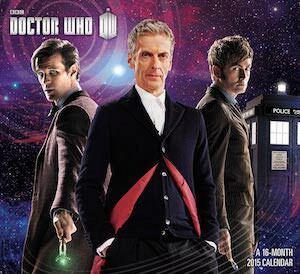 Not much more you have to know about the 2015 Doctor Who calendar so why aren’t you just make some room on a wall and order your Doctor Who 2015 Wall Calendar.